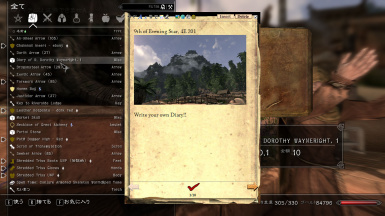 This MOD adds your own diary with Browser-based WYSIWYG Editor. You can use text-decoration, insert ScreenShot, Mark the written place and teleport there later. Very thanks to Bethesda Softworks. Very thanks to SKSE TEAM. Very thanks to Sam Stephenson. Very thanks to AUSGANG SOFT (http://a-h.parfe.jp/einfach/index.html). copy the 'data' folder into your Skyrim directory and enable 'AdventuresMemo.esp' and 'HTMLDialog.esp' both. 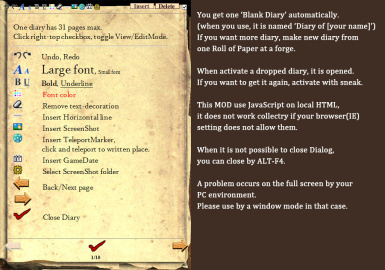 You get one 'Blank Diary' automatically. If you want more diary, make new diary from one 'Roll of Paper' at a forge. 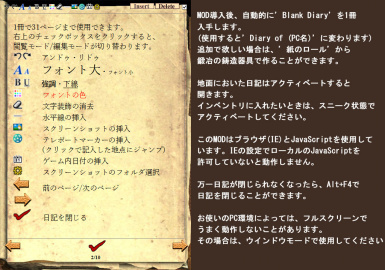 When activate a dropped diary, it is opened. If you want to get it again, activate with sneak. You can export/import diary, but teleport marker will be deleted. When it is not possible to close Dialog, you can close by ALT-F4. A problem occurs on the full screen by your PC environment. Please use by a window mode in that case. Please look "AdventuresDiary_help.jpg" in detail. V1.3 -fix teleport marker did not work correctly. old marker did not work, please delete and re-mark.